Resurrection Remix 6.0.0 [RR-O-v6.0.0] [Android 8.1 Oreo] is now available Unofficially for Samsung Galaxy A5. Samsung Galaxy A5 Android smartphone comes with a 5.20-inch HD display with a resolution of 1080×1920 pixels. The Samsung Galaxy A5 is powered by 1.9GHz octa-core Exynos 7880 processor with 3GB of RAM & 32GB of internal storage that can be expanded up to 256GB via a microSD card. As far as the cameras are concerned, the Samsung Galaxy A5 comes with a 16-megapixel primary camera on the rear and a 16-megapixel front-facing camera. Resurrection Remix Android distribution is a free and open source operating system for smartphones and tabs based on the AOSP source code which means that its UI is no different from stock Android on the Pixel phones. This new Resurrection Remix v6.0.0 (Android Oreo 8.1) is developed by numerous device-specific maintainers and uses Gerrit for its code review process. Resurrection Remix 6.0.0 is based on the Android 8.1 Oreo, which is the Google’s latest mobile operating system and is the safest and fastest version of Android, the RR-O-v6.0.0 [Android Oreo 8.1] is much better and has some unique features. The ResurrectionRemix v6.0.0 give you all lineage Os features with also some major customizations that make your Samsung Galaxy A5 faster and stable. Its ram management also good than stock ROM. If you own the Samsung Galaxy A5, then you can manually install the latest RR-O-v6.0.0 on your Android smartphone. However, Keep in mind that this is the Unofficial RR-O-v6.0.0 ROM for Samsung Galaxy A5. Therefore some features may not work properly as you expect. To flash this ROM, you need TWRP Recovery installed on your smartphone. If your phone is running TWRP, then you can simply download and flash the Resurrection Remix Oreo on Samsung Galaxy A5. Installing a custom RR-O-v6.0.0 [Android 8.1 Oreo] ROM on your Samsung Galaxy A5 requires the bootloader to be unlocked & TWRP/Custom Recovery Installed, which may VOID your warranty and may delete all your data. Before proceeding further you may consider backup all data on the phone. Proceed at your own responsibility. Before proceeding to the rooting process below, there are some pre-requirements make sure you follow all of them. You are the only person doing changes to your device and kbloghub.com cannot be held responsible for the mistakes done by you. 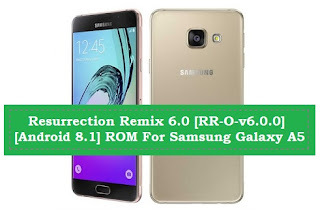 This new Resurrection Remix 6.0.0 [RR-O-v6.0.0] [Android 8.1] Rom has to be installed on the Samsung Galaxy A5 model only; if tried on other devices, it might get bricked [To check your device model: Go to Settings >> About phone >> model number]. You need to Unlock its Bootloader & Install TWRP Recovery on Samsung Galaxy A5. If you new to the process, then please follow the guide below. You can Download Rom & Gapps Files for Samsung Galaxy A5 from the above download link. Flash this custom ROM and enjoy the experience of Android Oreo-based features. Let’s go to the instruction. Guide to Flash RR-O-v6.0.0 on Samsung Galaxy A5 Using TWRP Recovery. Follow Guide to Root & install TWRP Recovery on Samsung Galaxy A5. Note:- If faced with boot loop problem, navigate back to TWRP settings, and select ‘Wipe cache/Dalvik’. This procedure will help resolve any issue with regard to custom ROM installation. That’s it! Your device should now have Official RR-O-v6.0.0 ROM installed ! Go to Settings > About phone to verify. So, that was the complete step by step guide on How to Install RR-O-v6.0.0 on Samsung Galaxy A5. Let us know how’s your experience with comments below.